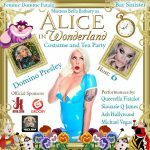 Grooby is proud to announce their latest DVD, The TEA Show 2018 Winners. The title is now available for purchase at GroobyDVD.com. The TEA Show 2018 Winners features a TEA winners Kayleigh Coxx, Mia Maffia, Nadia Love, Korra Del Rio, Casey Kisses, Megan Snow, and Annabelle Lane in seven highly anticipated scenes. Purchase your copy today at GroobyDVD.com.